How effective is marriage counseling? Does it work for all couples or just a certain type of couple? The methods we use are backed by scientific data showing that it works. How Effective is Marriage Counseling Really & How Can You Tell It's Working? The methods we use at both our Tulsa and OKC locations, are backed by scientific data showing that it works. We know that about 75-80% of our couples need about 15-20 hours of therapy from start to finish. There are some issues that require more or less time. We share more about that in the online video orientation you can access HERE. Our sessions are 2 hours in length. We recommend longer sessions than the average therapist because couples who come in are motivated and ready to see change in their relationship. The longer we spread it out the less momentum and the more life gets in the way. So why not take off less work, spend less on a baby sitter, and see change faster by knocking out counseling in much less time then traditional couples counseling? It only makes sense. But we must warn you, if you choose weekly counseling or coaching consistency is important. Some counselors say that every other week or twice a month for an hour is okay, but we have seen thousands of couples, maybe more than anyone else in the state, and if couples are skipping weeks in the beginning of counseling they set themselves up for a real struggle. If you can't commit to weekly counseling or coaching no problem! Check out other options HERE. In addition to coming each week, follow the therapist's instructions. The counselor will ask you to take a risk from time to time but they will help you and guide you in the process. It is important to talk about those fears so be honest with yourself, your spouse, and the counselor. As a client we offer a Client "Tool Box" that provides online videos and audio programs that you can take advantage outside of your sessions. Sometimes couples appreciate homework and sometimes couples find homework overwhelming. Homework is available if you would like it. Sometimes it is recommended and sometimes you will want to ask for it. But nonetheless, following the counselor's instructions during and after of your visits will help you make the most of counseling. Can Marriage Counseling Help Us? It depends on the counselor you go to. Sometimes therapists, despite good intentions, just don't have the training to help you. 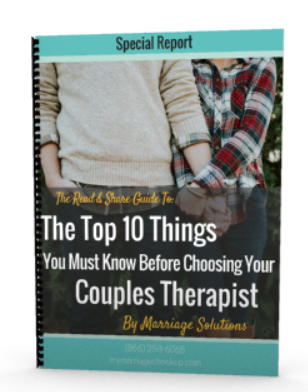 Many therapists try to see kids, families, teens, 10 different individual issues, and then add couples to the mix and they just don't have the time and energy to devote to the needs of everyone. That is why we devote 100% of our time and energy to training, researching, and developing methods to help couples and individuals with relationship issues period. A few of the methods we use to help couples are called Emotionally Focused Couples Therapy & the Gottman Method, which are both successful. The Gottman Method has discovered what the secrets are to making a marriage work and at the same time disproved a lot of myths. Emotionally Focused is by far the best method for helping couples connect in the most practical of ways. It also helps with destabilizing crisis in a marriage and rebuilding intimacy. We know your relationship is important to you. We will work together to identify what your goals are for marriage counseling i.e. help you and your partner to rebuild trust and rekindle the intimacy in your marriage, and manage conflict in a healthier way. We have worked with a wide variety of issues i.e. cheating, affairs, fighting, and emotional distance. Take a Few Relationship Quizzes to Learn More About Your Relationship HERE. It is like talking with a consultant or coach who specializes in relationship issues AND has a lot more education and training. The therapist's role is not to just to give advice but to help you think differently about problems and build skills to handle life's challenges. We are process consultants who help you to hear each other better and understand yourself and your spouse in ways you never dreamed possible. We help you fall back into love and experience a greater depth of intimacy in your relationship that will be there for you in the long term. Am I a failure for needing counseling or marriage counseling? No, we all need counseling at different points in our lives. Sometimes people and events are outside of our ability to handle them. Talking with a counselor is like talking with a consultant who specializes in these issues. We naturally do it when we talk with family and friends about problems but many times family and friends can actually hurt your relationship instead of help it. If you have further questions you can feel free to contact us directly or view our FAQ's and Resources page. We also have a blog section that includes helpful articles. At Marriage Solutions, we have locations in Tulsa and OKC so no matter where you live, you can find the help that you need.